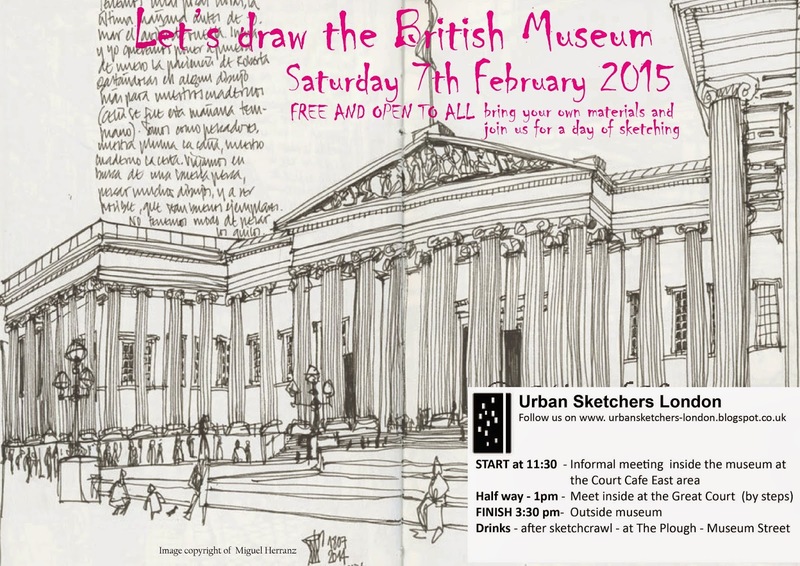 See below details of our next sketching event at the British Museum. 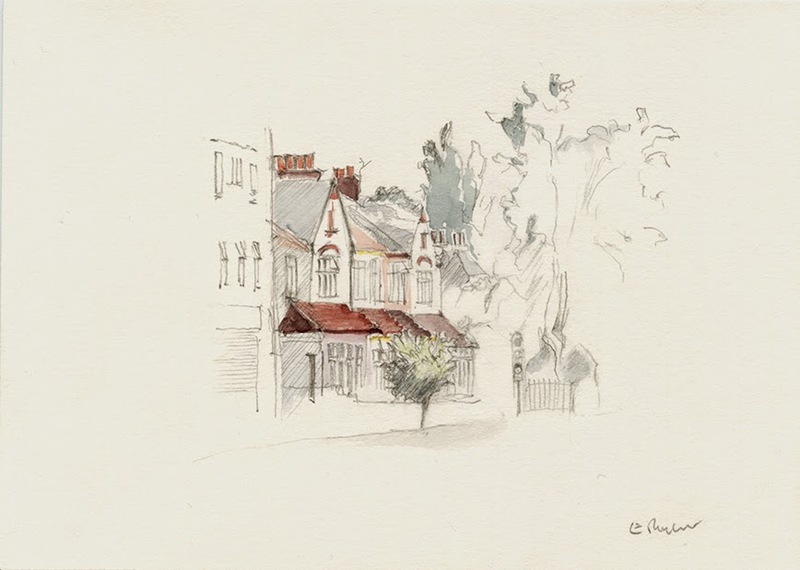 I stopped to draw the Mole Man's house in Mortimer Road, Dalston, as I cycled home the other day. It was once the home of William Lyttle, aka Mole Man, who tunnelled beneath it in all directions over more than 40 years, until complaints led to his eviction. (He was rehoused in a flat and was dead within a few years.) It has looked like a building site for years, but now there is activity above ground as it undergoes restoration. The architect David Adjaye, who designed the forthcoming National Museum of African American History and Culture in the National Mall, Washington, DC, among other buildings, is overseeing the design for the artists Sue Webster and Tim Noble, who are said to have paid more than £1m for the house at auction. It doesn't look anything special yet, unless you like corrugated iron and scaffolding. As Katherine mentioned, last week we had a meeting to organise our programme of sketchcrawls for 2015. See below our ideas and dates to pencil in your diaries. Please bear in mind that towards the end of the year dates may change. In any case, we will be posting updates closer to each date with details of times and where to meet before and after. at the junction with Glebelands Avenue, is this little terrace. I drew them from somewhere near the bus stop opposite the Odeon. I liked the evening shadows and the chimney pots of course. As a pencil drawing, it had been hanging around since the end of the summer, rattling on at me, "go on, get out the paint, you know you need to." Which was true, so I felt the fear, and did it anyway. I am Spanish but have lived in the UK for a long time, having come to study architecture in the early 90s. I've sketched all through my student and professional life, with colour and watercolour specifically as my main medium - colour is very important to me and it is likely to be the first thing I do in a sketch - although not always. Sketching/painting and drawing is for me the best way to remember where I've been on my trips and the memories of place and time will always rush back when I see an old sketch - one of my first experiences of drawing on location was a inter railing trip in 91 with a friend. I remember little of the trip except for the places I drew, that is the power of paying that little more attention to things when one sits down to sketch. More recently, I have taken art more seriously and take part on my local Open Studios Scheme - in Newbury (West Berkshire) where I exhibit locally every year and have taught watercolour classes locally. 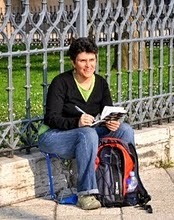 As a Spaniard, I joined the Urban Sketchers network in Spain first and attended the Barcelona symposium as a translator. 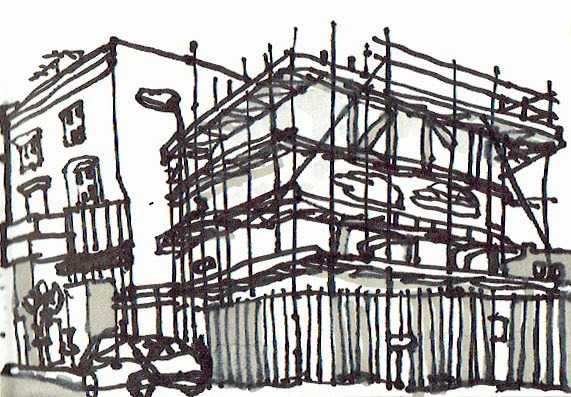 In 2014, I organised the Urban Sketchers workshop in Oxford with other urban sketchers and was pleased to coordinate the 44th sketchcrawl with the London team. I leave you here a couple of my view of London done in 2014 - a couple on the Portobello Road sketchcrawl and one from the Thames North Bank looking towards London Bridge and the Shard.